I usually keep my cell phone in my left front pocket. 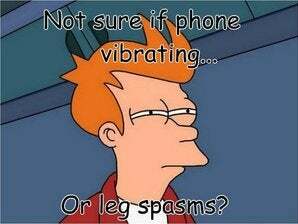 Sometimes, I will "feel" a vibration there, then realize my phone is not even on my person. Does this happen to you, too? Wired has an article exploring why that might happen to some of us. Phantom cellphone vibrations are surprisingly common. What causes this strange phenomenon? Black Hole BOB, won&apos;t you come?